Wave movements have a significant impact on the function and lifespan of ships, offshore installations and coastal engineering. This is why scientists and engineers study these effects in hydrodynamic research labs. Their findings lead to new engineering standards and improved safety. Bosch Bosch Rexroth will provide you with complete drive and control solutions for controlled wave generation. Different conditions such as wind, currents, water depth and water temperature have an impact on wave activity. In the open sea, the energy content of waves can therefore fluctuate by a factor of 1,000. Hydrodynamic research labs have to be able to map this broad range. The high density of water requires equipment that can generate strong forces and will work reliably and wear-free even when operating around the clock. 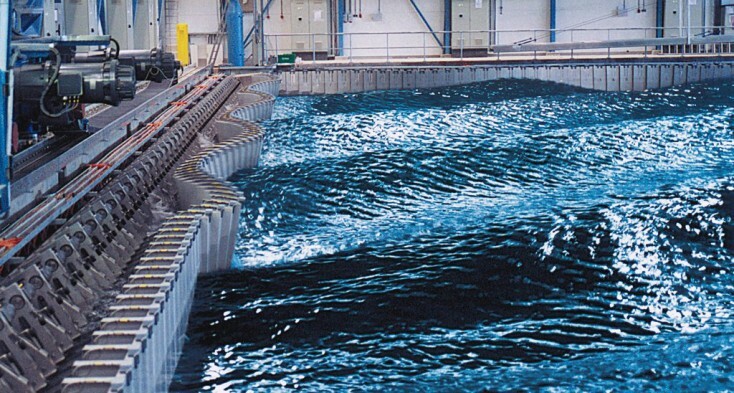 Rexroth develops customized drive and control systems for wave generators and wave absorbers as well as drive and fixing equipment for adjustable basin floors. Hydraulic systems from Bosch Rexroth have proven to be robust and low-maintenance. In addition, we supply custom-developed wave calculation programs and related data collection and analysis systems. Bosch Rexroth has been developing complete system solutions including all necessary hardware and software for a long time. As a result, our application experience benefits customers for different types of hydrodynamic research labs.